It would be an understatement to say that I love brights...in any form. Neon accessories, like shoes, are the perfect way to mix in color while dealing with the in between weather. Bold shoes are a statement maker and can be taken from a dressier occasion like a wedding to an everyday look. I had originally bought these shoes for my friend's awesome 80's bachelorette party. Don't get me wrong I had full intentions on wearing them...was just waiting for the right time to break them out. As the weather goes in between warmish to cold...the warmer days are perfect for these neon pink pumps. They are easy to just throw on and go. Paired with a pair of your favorite skinny jeans and a oversized sweater, its the perfect look for a casual day out. 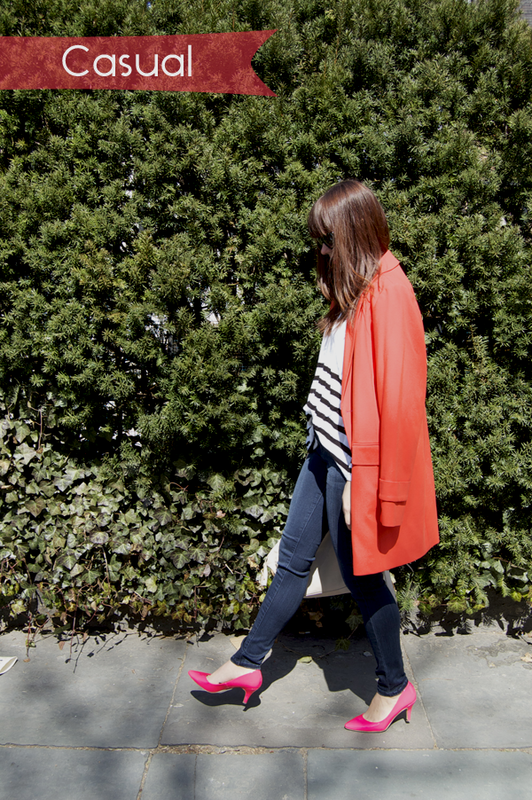 Be a little bold and color block it with a bright trench jacket. Pink and grey is one of my favorite color combinations, it's the mix of hard and soft that I love. The pairing of pink and grey is perfect for an early spring wedding celebration. A grey tone can be dark but with the neon pumps it brings in a touch of spring. Since these shoes are so strong, go easy on the accessories-- do light and dainty accessories. Would you be bold and wear neon pumps? I need more bold shoes in my closet! I'm more of a black shoes girl, since they go with everything, but it's fun to mix it up every now and then. I love the idea of mixing hard and soft, especially with the bright pop of color the shoes add. Both looks are great! Love both the casual and dressy looks! Amazing style! Love both outfits, but I prefer neon pumps with jeans!! Adore both the looks..but i love the casual look with that gorgeous jacket with that bright pop of color more .. Cute post, love the casual look. Beautiful outfits and great styling.